Well, this could have been bad. According to White House sources and news outlets in Washington, D.C., a masked intruder just made his way past security, broke into the White House, and gave President Obama a free guitar lesson before finally being apprehended by the Secret Service. It seems like this was a giant security failure all around. Not only was the anonymous intruder able to make his way inside the White House and into the Lincoln Bedroom—he was able to teach Obama several basic chords and the opening riff to “Sunshine Of Your Love” before the security breach was even detected! It seems like somebody needs to get fired. In the aftermath of the guitar lesson, during which the intruder taught the president the names of all the guitar strings as well as the C-major and A-minor scales, the Secret Service issued an apology and took full responsibility for the incident. However, a simple apology might not be enough. 7:32 a.m.: Anonymous, masked intruder scales White House fence and enters White House undetected through unlocked utility door, chiefly used by maintenance staff. 7:43 a.m.: Intruder gains access to the main hall of the White House through a service tunnel. 7:52 a.m.: Intruder locates President Obama in the Lincoln Bedroom, unattended by Secret Service. 8:00 a.m.: Intruder allows president to borrow a cheaply made nylon-string acoustic guitar. 8:06 a.m.: Intruder plays fast, impressive solo to show President Obama what he’ll be able to do if he works hard at the guitar and really sticks with it for a few years. 8:12 a.m.: Intruder tells president that the strings of the guitar are tuned to E, A, D, G, B, and E, and teaches him the acronym “Eddie Ate Dynamite, Good-Bye Eddie” to help him remember it. 8:16 a.m.: Intruder asks president if he’s more interested in rock or jazz. 8:18 a.m.: Intruder teaches President Obama the E-major, A-major, and D-major chords. 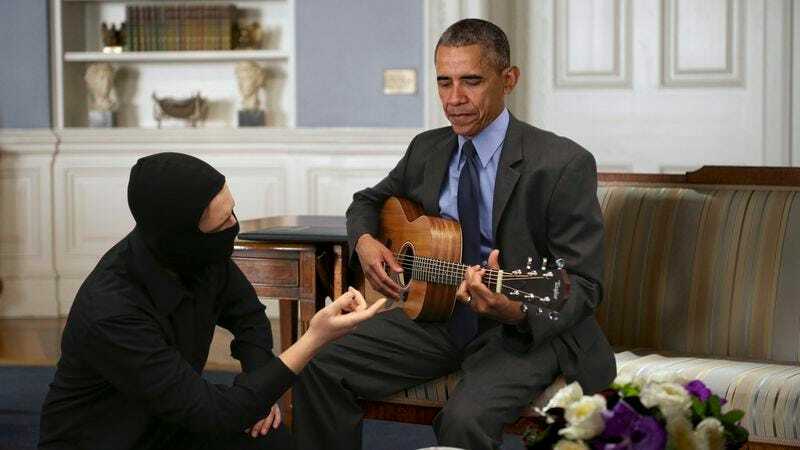 8:25 a.m.: Intruder attempts to teach President Obama an F-major bar chord. 8:32 a.m.: Intruder reassures discouraged president that bar chords are challenging and that he can work on the F-major bar chord on his own after the lesson. 8:35 a.m.: Intruder teaches President Obama the opening riff to Cream’s “Sunshine Of Your Love.” President proceeds to play riff repeatedly for the next 10 minutes. 8:45 a.m.: Secret Service agents apprehend the intruder and usher the president to a secure location. For those of you keeping track, that’s more than a full hour between the time that the intruder broke into the White House and when Secret Service interrupted the guitar lesson he was giving to the president. Yikes. Hopefully, the Secret Service is taking measures to prevent anyone else from getting inside the White House to teach the president how to play guitar. In the meantime, Obama should consider making some major personnel changes!